I had to visit the BIG railway to take my son, Tim, to Kingham to catch the train home (Baldock, Herts). Train due at 12.53, we arrived 20 mins early. By 12.40 the announcer said that the train was running 23 minutes late. At 13.18 they announced it had been cancelled! Next one was at 14.55. So, I said, I'll drive you to Oxford. En route, the temperature was around 34C (93F). Thank goodness for air con! In the centre of Oxford, the car was saying that it was 37C (99F) outside! I don't recall it being that hot ... ever! Anyway, despite catching a train immediately upon arrival, it was a slow one, and the one out from London was also slow, so Tim got home just 10 mins earlier than if we'd gone in the pub and waited the 2 hours! Sorted through brushes for boot scrapers - this batch comes in 3 widths, one of which is useless! Painted some ready for fitting (did one coat at 08.40 and another coat at 18.30). Saw 2807 chuffing round its stock - all seems to be well. Following Sunday's phone call from The Coffee Pot to say they'd sold all of the boot scrapers, I was able to re-stock. As far as I can assess, no one from our group attended Todders. I was off Roman snail hunting at Chedworth with daughter & granddaughter. 2807 still storming away from Todders while I was fitting brushes to rail chairs. Trying to get enough ready to re-stock C.Pot and F&W on Saturday. Called in to C.Pot for a slice of cake - 2 boot scrapers had gone, and a chap was looking over the remaining four, trying to decide whether to buy one or not. A huge consignment of hardwood arrived at Winchcombe destined for the restoration work that is ongoing on our siphon van by Fred, Gilbert & Ray (and Colin & Anne on alternate weeks). Restocked the F&W with boot scrapers. Completed half a dozen more. Diesel weekend, so no steam in service. 2807 is back in service on Tuesday for the whole week and the first weekend of August. I couldn't see any new issues on the loco's log. "Peak" diesel, 45149 (aka Phaeton or D135) is in service after an eventful inaugural run on Thursday evening. Speaking with their crew, it is reminiscent of 2807's early days in action - little things keep going wrong, dropping off, etc. But it's not yet done 100 miles, and we are only too aware of teething problems! F&W sold 3 b/s during the week, and C.Pot sold 2. Early this morning the buckle was straightened out using the tele-handler but given the extended period of warm weather it has been decided to put a temporary speed restrictions of 10mph over the area of the buckle until further notice. The temporary speed restriction is marked out with yellow speed boards. All drivers are to obey this restriction and keep a good lookout ahead when approaching this area. If there is any sign of deflection in the track then drivers must stop and examine the line before proceeding and must also report their findings to the signalman when they leave the section. Drivers should also keep a good lookout on all other areas of the line during this exceptionally warm weather. Bruce valiantly painted more rail chairs. I could only spend a short while there because it was granddaughter's school sports day. Carol B came to collect her boot scraper - she rang me Tuesday to say she didn't like the ones in the F&W or at Winchcombe. Today she explained that she wants one that says "GKN" as manufacturer (because she used to go past their factory in days of yore); and not one saying "BR" because of what's happened over nationalisation and de-nationalisation. So, I found her a GWR + GKN. The lengths I go to for customers! 2807 passed the school playing field twice during sports day - seems to be going well. Saturday 13th - Supporters' Day. Well, my thermometer said 30 deg on the way to Toddington, and it said 30 deg on the way back! It must have been warm on the footplate. Very many thanks to Stuart for organising the day, and to the helpers - both on the train (David, Sue, Fred and others) and on the stall (Gil, Richard, Dixie, and more). 2807 ran beautifully, (tempted to say "of course"). After being out of service for June (basically, being delayed during boiler wash-out), it is good to see her running again. Fred has just placed an order for miles of timber to start replacing the sides of the siphon van. I was talking to Ian Chilton about a box van that he's working on at Toddington. The wooden sides rotted in exactly the same way as our siphon - bottom up! So, even when 2807 is happily chuffing up & down, we still have things to do: the siphon, and boot scrapers! Looks like the NRM at York is safe - for the moment anyway. Roy Gamlin came down wearing his FLA cap, and sorted through bric-a-brac. Mostly this was pricing up books, but also included throwing out unsaleable items. Meanwhile, I pressed on with painting rail chairs. I spent a couple more hours on rail chairs. Bruce came and assisted during the morning, with John Mayell relieving him for the afternoon session! We prepared 10 or more chairs, and I did some painting. However, I had run out of painted brushes, so couldn't proceed much further. F&W had only 2 left, so I restocked with the remaining 4 completed ones off the shelf. Painted brushes had dried, so I was able to fit 4 boot scrapers ... before running out of wedges. Colin & I arrived at Winchcombe - independently, coincidentally, and with the same thought: to cart a few more chairs to Todders! Back at Todders, we spent a couple of hours painting chairs that had been prepared, or were in various stages of completion. I couldn't finish any off, because of the lack of wedges. Back at Todders, John was cleaning even more; David was welding up some fixing plates for a pair of wheels for one of the trolleys. These wheels materialised by magic, next to the skip. I monitored their progress for a couple of weeks, and having decided that they were not going anywhere, I decided to take action! 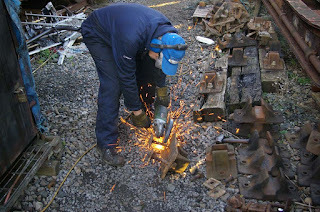 Anyway, David did the cutting and welding of metal, and made them fit the trolley! Brill. I completed 5 boot scrapers (including one ordered by Bruce*) before lunch and retiring to the training room for a CSPL Board Meeting. I noticed a group of young chaps lighting up 2807 during the afternoon. She's in service Sunday, then Tuesday to Thursday, and the weekend of 13/14th. * On Wednesday, Bruce asked me if we have any of the very old GWR chairs. I said that I hadn't seen one for ages and thought that we did not. Then, as if by magic, five minutes later, as I was tidying up and sorting chairs into piles, what should I discover? One GWR dating from 1901.